“Give me a ticket for an aeroplane…” This song was inappropriately playing in my head on 19th October 2012 when I, ticket in hand, nervously boarded the plane headed towards New Delhi. Before me lay a place that I had once visited on the fly-through to Varanasi and back. It was practically unknown territory holding an uncertain future. I felt a sense of adventure and trepidation because I could not be sure that everything would be okay. Sure, you know that I survived, since it is now 2018, but I wasn’t so sure of that. I felt prepared for anything, just not entirely ready for it – this being the first trip I was to undertake on my own in all my life. I undertook this trip during my semester abroad. My study regulations requested either a language course, an internship (“praktikum”) of at least six weeks or studying at a university in an English-speaking country. Since my minor subject was Indology, it made only sense to go to India for it. Sadly, there was not much of a regulated exchange, the DAAD (the German Academic Exchange Service) only offered programmes for a year abroad in India. But when I was planning this semester, I didn’t want to leave for that long because my remaining grandmother was old and frail, and I feared very much that something would happen, if I was away for too long. On a very sad side note, by the point I was leaving, she had already died a few months before. That aforementioned situation, however, left me with the only option: planning everything on my own. To sum this up: I was going to a foreign country, on my own, having planned the trip myself, not knowing whether it would work out as planned, or would work out at all. I was planning on staying at an NGO in the south of New Delhi, where I would theoretically teach children from the neighbouring slum (and non-slum-areas surrounding that NGO), live in a flat share with other volunteers of said NGO and… I didn’t know much more about it. I knew that I was supposed to be fetched from the airport and taken to that NGO. With that scant, but confirmed information (I had gotten acquainted with that NGO via a family member of mine) I boarded the plane and arrived eight and a half sleepless hours later in New Delhi. On arriving there, I was at first disoriented. You just sense that you are somewhere else, somewhere that is not your home (yet). There is the light, which seems softer. 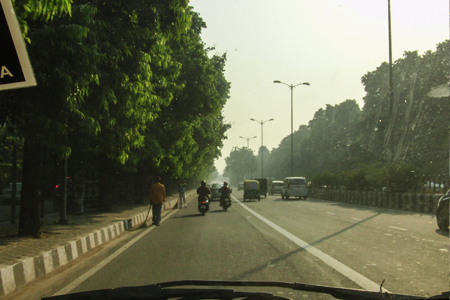 There is the temperature, which is a lot higher in New Delhi than it is in the middle of Germany – and there is the decidedly more humid air, that also smells entirely different. Delhi is breathtaking – in more than one sense of the word... Breathtakingly big for a girl from the village, breathtakingly smoggy for someone used to country-air, and breathtakingly full – full of life, people, colours, options and barriers.